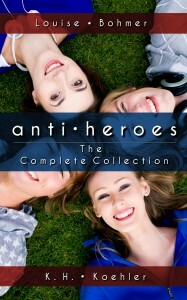 Anti-Heroes: The Complete Collection is here! My writing partner K.H. Koehler and I are thrilled to let you know Anti-Heroes is now available in one complete volume! Serena is the new girl in a school that caters to not just “Norms,” but the sons and daughters of the world’s greatest Superheroes. The problem? She’s the daughter of the Night Witch, a cardinal member of the League of Extreme Evil. She’d love to join the other super teens and prove she isn’t the villain that her mother was, but it isn’t long before she falls in with a group of Supervillains that the school calls the Geek Squad, which includes a biochemically created vampire named Nikki, a genetically altered jock named Isaac, and Jinx, the son of Satan himself! She’s immediately attracted to Jinx, but Serena has vowed to do what’s right. But there are secrets buried deep within Serena’s past that threaten to kill her, and even rock the foundation of Earth itself! An evil decay is reaching out from a distant star, and the Supers and Geeks will need to work together in order to defeat it–if they can keep from killing each other. The Supers thought the greatest battle for control of Earth had been fought and won, but a cosmic war is coming, and it isn’t long before it’s difficult to tell the difference between hero and villain.